1.Each human being is incredibly unique. Sure, there are some common threads that tend to run through the stories of the people I work with, but each person’s circumstances and their response to those circumstance, is distinct. Each student brings their own strengths, struggles, and joys to our class. When they open up and share their uniquely talented selves, awesome things can happen. 2.Finding a job when you have a criminal background can be extremely difficult. Persons with a criminal history desperately want a second chance at life but encounter a lot of obstacles when searching for employment. In addition to overcoming a work history with holes created by incarceration, these individuals often face the prospect of having to disclose some of their most regretted decisions to a near perfect stranger with the power to hire them or turn them away. If they can find work, they often have to settle for low-wage, high-stress positions in companies that do not treat their employees well. 3.Resilience and attitude mean more than I ever knew. In the midst of transition, loss, and struggle, so many of my students have shown an uncanny ability to remain focused on their goals and maintain a positive outlook. I am astounded by their ability to do so in the midst of so many challenges. Interestingly, the students who maintain a positive outlook throughout their job search seem to have a way of finding employment. David (name changed for confidentiality) was the first guest I saw on a Wednesday of a hectic week. Our summer interns were scheduled to leave on Friday, and I was bracing myself for a busy season with fewer staff. Because I was absorbed in my own stress, I was unprepared for the cheerful, hopeful voice that responded when I called, “David?” at the intake window. “Right here!” David met me with a smile and a cast on his right arm. As we completed his paperwork together, David revealed pieces of his story to me. His partner of 26 years had passed away less than a year ago. After that, his life changed. He never specified what he meant by that, but it was clear that, like many of our guests, David never expected to find himself without a job or a place to live, much less both at the same time. Furthermore, David had recently gotten in a fight, resulting in an injury to the fingers on his right hand. That’s why he had come to see us. David didn’t have an ID, and, in order to schedule a surgery at Grady, David needed ID. And soon. He told me that if he wasn’t able to have surgery in time, he might have to have his fingers amputated. While amputation is never a first choice for anyone, it would be an especially hard blow to David, who works in Physical Education. He had just recently secured a job as a middle school volleyball coach after a period of unemployment and needed to keep the job in order to gain back the security he once had. I told David we would do everything we could to get him what he needed in order to get him medical care. I instructed him on how to get a voter picture ID, so that he could at least have something with his name and picture on it. I laid out the steps for him to get a Georgia ID. David looked at me, his eyes full of hope. It was clear that, for the first time in a long time, David was able to see a way out of his current circumstances. He attempted to tell me some more of his story, about his partner, but became too overwhelmed. David choked back tears, thanked me again, and went on his way. A couple days later, David returned. He had obtained everything he needed to get a new ID and only needed us to issue him a voucher that would allow him to do so for free. He was still concerned, though, about scheduling his surgery. He had had some issues scheduling it at Grady, so we gave him some information about Mercy Care, one of our partner agencies that provides medical care for many of our guests. David apologized to me for his emotional exit earlier in the week and informed me that he was feeling much better. He hugged me and one of our interns who had assisted him. He left with a smile, feeling even more hopeful about getting the help he needed. Another week passed, and, during another busy morning, I walked into our waiting area to find David eagerly sitting on the edge of his chair. As soon as he saw me, he sprang out of his chair and handed me an envelope. 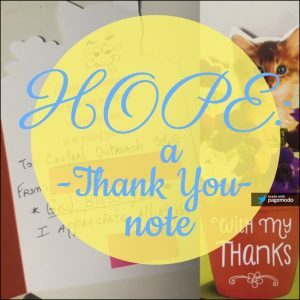 I put the thank you card behind our front desk, so that we can look at it every morning and be reminded that our sometimes simple actions, such as issuing an ID voucher, can provide hope, and even save fingers. 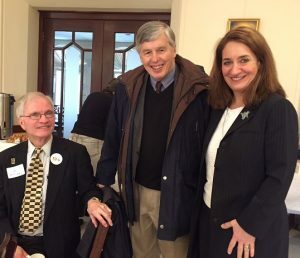 Long before I joined the board, I had lobbied hard for the inclusion of an advocacy component to the work of the Central Outreach & Advocacy Center Center. So, when Lee Carroll asked me to become part of the governance team, it was time to put up or shut up. It has been a wonderful six-year run, made especially meaningful for me by the way in which the advocacy part of the program has continued to develop. We still have a long way to go, but we also have made significant progress on that front. 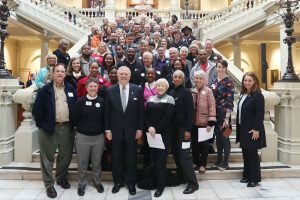 Two facts stand out in my mind: there are still too many laws and regulations that make it easy for people to slip into a condition of homelessness and difficult to escape it, and a lot more people (including legislators and well-intentioned church-going folks) need to be educated about the facts, so they can respond in a helpful way. I’m also very pleased with the way that the OAC has brought increased focus to bear on a case management approach to working with our guests, even while continuing to provide emergency assistance. The Main Frame Job Readiness Program continues to generate positive results, and I only hope we can increase the scale of its operations. 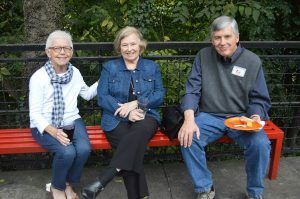 None of our progress would be possible without the assistance of loyal volunteers and a growing cadre of donors who have caught the spirit that what we are doing at the Central Outreach & Advocacy Center is important and deserves support. They and the dedicated staff have made my involvement one of my most enjoyable experiences in the not-for-profit world. Martin Lehfeldt went to work at Clark College (now Clark Atlanta University) and adopted the South as his home in 1969. Before that time he had graduated from Haverford College and Union Theological Seminary in New York, been a newspaper reporter, and spent four years as a program director for the Woodrow Wilson National Fellowship Foundation in Princeton. After 10 years in the Atlanta University Center, he formed his own firm and provided fund raising, planning, and organizational development consulting to local, regional, and national not-for-profit organizations for 18 years. He became the President of the Southeastern Council of Foundations (SECF) in 1998 and held that position for 11 years. Mr. Lehfeldt is the author of The Sacred Call (a biography of Donald L. Hollowell),Notes from a Nonprofitable Life, and Thinking about Things (a collection of his monthly newsletter columns while at SECF, and the editor of On Our Way Rejoicing, compiled in celebration of Central Presbyterian Church’s 150th anniversary. He is a former board member and chair of the Academy Theatre, the Center for Positive Aging, the Forum of Regional Associations of Grantmakers, the National Hurricane Fund for the Elderly, Literacy Action, Inc., and Johnson C. Smith Theological Seminary, and just completed his service as a board member of the Central Outreach and Advocacy Center. He is married to the former Linda Graham. They have three productive, mortgage-paying children and three grandchildren. One seldom knows all the reasons he or she volunteers to serve with a non-profit organization. But after thinking about it, I believe that my core reason for serving with Central Outreach & Advocacy Center is that it helps me fulfill my vocation. Let me explain. I grew up in South Mississippi in the dark days before desegregation, in the days when racial and economic discrimination was accepted as simply “the way things are.” As I neared adulthood, two powerful forces somehow converged in my life to challenge that world view. First, following an extended period of discernment, I concluded that my calling in life was to serve as an ordained minister of the church of Jesus Christ. And second, the civil rights movement drove me to come to terms with sharp discrepancies between the teachings of my society about race and class, and the teachings of the Scriptures and my theological tradition. In the end, I concluded that racial reconciliation and economic justice are core to God’s mission in the world, and that I wanted to be a part of that mission. 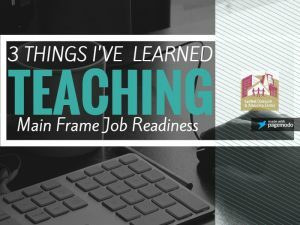 Now, as I look back upon my many years as a Presbyterian pastor and theological educator, I know of few things that have brought me more satisfaction than pursuing that part of my vocation. Central Outreach & Advocacy Center has offered me an amazing context in which to practice that vocation because Central OAC serves those who are homeless. No other people in our community are more likely to be the victims of racial prejudice or economic injustice than those who are homeless. No other people are more likely to suffer from shameful attitudes and public policies that are obstacles to overcoming their plight. I think of Central OAC as “a small organization with a great big heart.” A big heart for those struggling to find freedom from the shackles of homelessness. A big heart for helping people rediscover dignity in their lives. A big heart for standing with the poor in seeking public policies that can improve their lives. So why do I serve on the Board of Central Outreach & Advocacy Center? Because the “big heart” of Central OAC seems to me to be akin to the heart of God. Because it brings a sense of integrity to my life. Because I believe that God is at work in and through this dedicated company of colleagues who seek justice and equality for all. 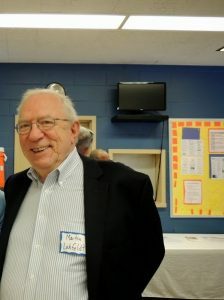 R. Leon (Lee) Carroll, Jr. is an ordained minister of the Presbyterian Church (USA) and is Associate Professor Emeritus of Columbia Theological Seminary, Decatur, GA where he taught from 1983-2009. Prior to that, he served as a pastor with Presbyterian congregations in Memphis TN, Louisville, KY and Charleston WV. He is married to Betty Wilby Carroll, and both are natives of Laurel MS. They have two grown children and three grandchildren. Lee is a graduate of the University of Southern Mississippi (B.S.) and Columbia Theological Seminary (M.Div.). He has served for numerous terms on the Board of the Central Outreach and Advocacy Center and was Board Chair from 2010 to 2015. He is also a previous board chair of Our House in Decatur GA; the Appalachian Ministries Educational Resource Center in Berea KY; and the Urban Training Organization of Atlanta.